Scribblenauts devs to move towards consoles. With their hotly awaited type-'em-up Scribblenauts less than a month away from a North American release, 5TH Cell look to have a big, turkey hat-shaped hit on their hands. In October, Drawn to Life will be getting a DS sequel too. But then what? Speaking to GameSpot, studio cofounder and creative director Jeremiah Slaczka thinks their future shall lead them down a new path. This is our big last hurrah for DS games. That's it for original stuff. We're now going to move on to consoles in the next year. We might still do DS; I'm not saying we're not going to. But our focus is definitely going to be on console. 5TH Cell are behind creative DS gems Drawn To Life and Lock's Quest. 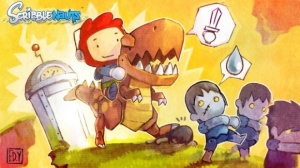 Drawn to Life is on it's way to Wii, so maybe one day we'll see a Scribblenauts sequel hit the living room too. Possible? I really like Scribblenauts and think there's a lot of potential there, so we'll see what happens. Wonder whether they mean Wii or all the others? Scribblenauts Wii would be cool, but first let's hope the DS version doesn't disappoint. I'm thinking they will develop for the Wiiware. It would be perfect fit for them. Anyone else agree? I seriously don`t know what is so great about Scribblenauts? At best it looks average as well as Drawn to Life was. Either way, 5th Cell hasn`t impressed me the slightest. Still, I'll keep an eye on it just in case. Yes definately, I don't know if these guys have ever worked on large high budget console games before so WiiWare would be the perfect start for them. I would love to see what they do with the Wii remote, they obviously liked working with the touch screen as apposed to buttons. 5th Cell maybe a bit over hyped, but they do show initiative and aren't afraid to be creative, which is a good thing in this day and age. Lock's Quest was also a fun game and I am very much looking forward to Scribblenauts because nothing like it has been done before to my knowledge. I hope they move to Wii, or even WiiWare. Lock's Quest for Wii would rock. @Chrono Cross: Part of the appeal of Scribblenauts is the same as the appeal of the 20Q handheld. What can you come up with that will stump the game? From what I've seen, you can be pretty creative in what you create to solve the problems leading to you trying to find how many different and unique ways can you solve the problem. The better your vocabulary the more options you have within the game. There games so far seem to fit nintendo consoles rather than the other narrow minded ones. Its for The Ds. I think this game would be fun!! Cant Wait!! !